Teachers and schools need to check for learning throughout the school year, not just wait for final examinations. Formative assessment can improve student outcomes if part of a fair, valid, and reliable process of gathering, interpreting, and using infor­mation generated from methods used throughout the student learning process. Formative assessment methods include a combination of the following: student observations, class assignments, projects and presentations, performances, peer reviews, conversations and interviews with students, learning logs, and quizzes and tests. 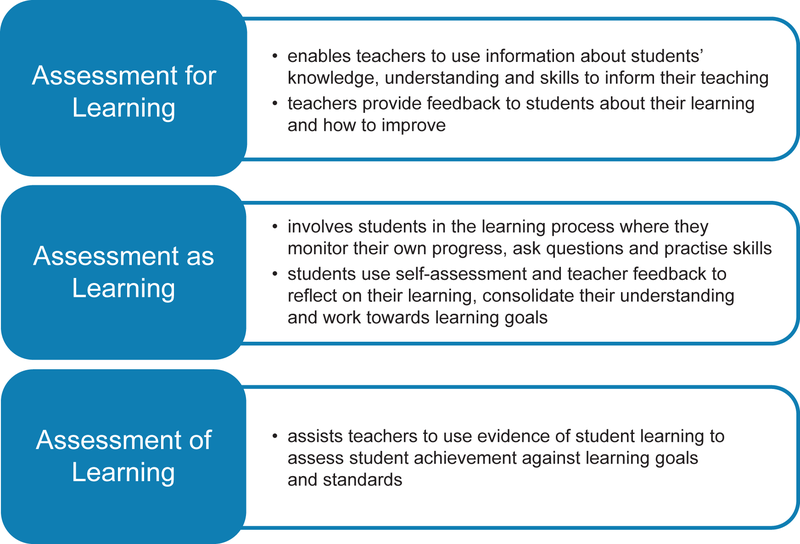 The formative assessment process is effective when part of a school-wide assessment system that ensures teachers are using multiple assessment paths, assessment plans, and high quality assessment standards. Teachers’ assessment practices should also be supported by an evidenced-based school-wide assessment policy. Bennett, R.E. 2011. Formative assessment: A critical review. Assessment in Education: Principles, Policy and Practice, 18, 5-25. Dunn, K. E., and Mulvenon, S. W. 2009. A critical review of research on formative assessment: Limited scientific evidence of the impact of formative assessment in education. Practical Assessment, Research and Evaluation, 14(7), 1-11. Looney, J. W. 2011. Integrating formative and summative assessment: Progress toward a seamless system? OECD Education Working Papers, No. 58. OECD Publishing. Province of Manitoba. 2006. Rethinking Classroom Assessment with Purpose in Mind: Assessment for Learning, Assessment as Learning, Assessment of Learning. Manitoba Education, Citizenship, and Youth, School Programs Division. Wagner, D. A. 2011. Smaller, Quicker, Cheaper: Improving Learning Assessment for Developing Countries. Paris: UNESCO-IIEP.